For centuries, the prisoners of Incarceron, the terrible living steal prison, have lived in darkness. They barely survive, staving off starvation through violence and trickery. Finn is a prisoner, but he knows that unlike the rest of the people in Incarceron, he was born Outside. Outside, Claudia is no freer than Finn. As the daughter of the Warden, she is doomed to be a prisoner in a loveless marriage to the over-indulged prince, soon to be in the clutches of the evil queen. But when Finn and Claudia each find a crystal key that allows them to communicate, and together they work to get Finn and his friends out of Incarceron in the hopes that their actions will free them both. Incarceron starts out with a bang and doesn't slow down. This novel's world is very queer and fascinating, especially when it comes to the descriptions of Incarceron, but it felt as if at times Fisher didn't fully explain the situation or the history that led the society to where it is now, leaving some confusion. However, the characters of the novel are very well done--Finn is persistent and resourceful, determined to gain his memory back and learn what his life was like before. Claudia is daring and quick-witted, and a bit sharp at times, but she is relentless and just as determined as Finn. The story volleys back and forth between the two, creating palpable tension that propels the reader along, farther into the depths of Incarceron. Though it is a bit obvious early on in the book the who and why of the mystery, it is the how and the mystery of Incarceron itself that readers will work through to learn. The ending is quick and surprising, and despite the length of this book, the conclusion to the conflict will have to be found in a sequel. I can hardly wait. Cover Comments: I like how modern and yet medieval this cover looks. Since Incarceron really is a pretty cool mix of sci-fi and fantasy, it fits well, and the key and the title treatment is very cool. I like it a lot! 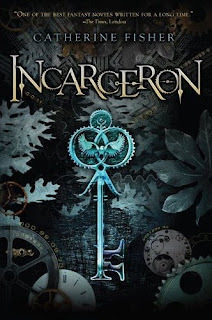 Incarceron will be released tomorrow, February 9th, 2010! I'm so glad you liked it! I just got this from my library and really look forward to reading it too. I always find good books from your blog. Great review!